Every gung-ho winter sports fanatic has a ski or snowboard bucket list memorized, if not stitched into the lining of their jacket. For some, flying down the runs of Whistler, British Columbia — jagged mountains towering above — could be numero uno on their wish list. For others, the gnarly off-piste chutes of Mürren, Switzerland (accessible only by cable car), may be the crème de la crème. Some skiers may even covet a day spent attempting to keep up with Olympic racer Lindsey Vonn (good luck with that). But while these goals and locations are commendable, and undoubtedly contain some of the best snow in the world, genuine powderhounds agree that the true golden egg of skiing resides in the elusive sport of heli-skiing — the act of being carried to remote backcountry runs by helicopter. 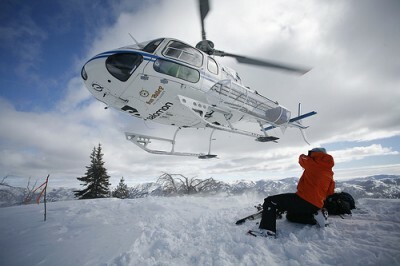 What’s so great about heli-skiing? It carves out the most desirable aspects of slope-side fun and eliminates the worst (lift lines, out-of-control beginner skiers, icy terrain and pesky snowmaking machines don’t exist). While I regret to inform you that I’ve never had the luck of participating in this activity, like thousands of other skiers, the mere thought of heli-skiing has me shaking with excitement in my (ski) boots. In a recent Financial Times article, one fortunate writer had the opportunity to combine heli-skiing, ahem, I mean heli-snowboarding with a snowy destination few people even dream to place on their bucket list: The Himalayas. Sheesh, and you thought Killington’s Superstar was the epitome of snow sport fun. Despite battling altitude sickness, the ever-present threat of avalanche and a sun strong enough to form the dreaded raccoon eyes within minutes, snowboarder Ekow Eshun describes the 1,000-meter run as “exhilarating,” and the powder as “untrammeled.” For sure, a true bucket list ski adventure. But at just under $9,000, a week’s worth of Himalaya heli-skiing (not including your flight to Delhi) is definitely not budget travel. So don your snowpants and head to the nearest ski resort — even Indiana has one, Google it — because you’ll be saving for this trip of a lifetime for longer than one season.